As Violent Crime Drops, Why Is Law Enforcement More Militarized? What is the 1033 program? Well, it’s a law that says excess equipment from the Department of Defense can be transferred to local law enforcement. It started in the 1990s. Since then, $4.3 billion in equipment has been handed over to local police forces. Police forces in general have become more militarized in recent years as more and more include SWAT teams. SWAT raids have increased 1400% between 1980 and 2000, according to Peter Kraska, an Eastern Kentucky University professor who tracks SWAT data. 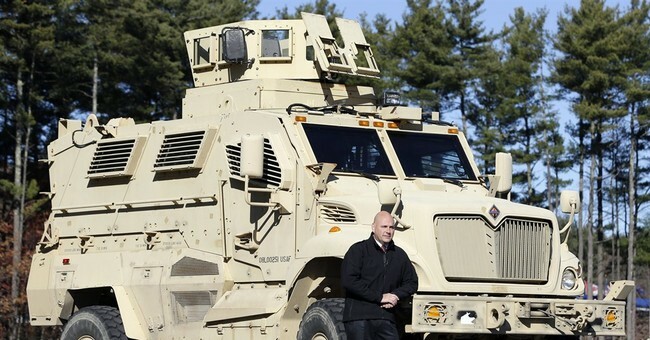 The New York Times recently reported on a small Wisconsin town where the local police’s acquired MRAPs — mine-resistant vehicles more commonly seen in war zones than small-town America. It seems sort of ridiculous for this military build-up in our law enforcement given that violent crime is continually declining. According to the FBI, in the first six months of 2013, murders declined 6.9 percent, forcible rapes declined 10.6 percent, and aggravated assaults decreased 6.6 percent. Charles Cooke at National Review not only mentioned in his June 27 article that violent crime has hit a 50-year low, but that these militarized police forces are more dangerous than anything they’ll encounter maintain law and order. So, has this agreement between the Department of Defense and law enforcement resulted in casualties? Sadly, it has – with Alecia Phonesavanh detailing a drug raid on her home that left her two-year old son with injuries so severe from a flashbang grenade that he had to be placed in a medically induced coma. The raid itself was a mistake, as the person police were trying to arrest didn't even live there. The ACLU reported recently that SWAT teams in the United States conduct around 45,000 raids each year, only 7 percent of which have anything whatsoever to do with the hostage situations with which those teams were assembled to contend. Paramilitary operations, the ACLU concluded, are “happening in about 124 homes every day — or more likely every night” — and four in five of those are performed in order that authorities might “search homes, usually for drugs.” Such raids routinely involve “armored personnel carriers,” “military equipment like battering rams,” and “flashbang grenades.” Were the military being used in such a manner, we would be rightly outraged. Will the Right acknowledge the scale of the threat, applying its usual mistrust of power to a favored group, or will its usually alert advocates leave themselves willfully in the dark until, one day, a flashbang with their name on it is tossed through the window to wake them up with a start? I couldn’t agree more. Conservatives should be weary of this trend. It's fine to be tough on crime – we should. But, when toddlers have holes in their chests that expose their ribs from flashbang grenades – and the threats that require the deployment of these heavily armed vehicles/forces aren’t proportional – what’s the use for all of this excess military equipment? After all, where in America do you see homeowners dotting their properties with landmines that would justify the use a MRAP vehicle?